It is a truth not often acknowledged that anticipation of a thing often brings as much pleasure as the thing itself. For quite some time now, I’ve greatly anticipated two things. 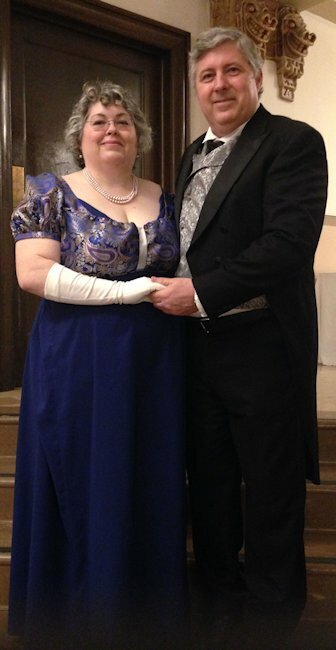 The annual JASNA Regency Romance Ball and my debut post here on Austen Authors. My preparations for the ball began early. Regency drawings and portrait galleries on Pinterest served as inspiration and I decided that rather than renting a gown this year, I would sew one. Perhaps I ought to mention that my last sewing project was more than a decade ago. I ordered a pattern that was authentic to the period, featuring a bib-front with something called a stomacher and puffy sleeves. Once I had that, I shopped for fabric, spurning muslin in favor of faux silk and a beautiful gold and silver threaded paisley for the bodice. I ordered slipper shoes, elbow-length gloves, silk stockings, a corset. fan and some lovely fragrant soap that would be the only scent I wore. All that remained was sewing the dress, making a turban with two ostrich feathers, a reticule, two shoe roses and if I had time, a cape. Yes, I would be the very picture of a Regency lady! In my optimistic naiveté, I imagined it would all come together seamlessly. Unfortunately, there were seams – and lots of them, along with missing bobbins, a machine that hadn’t been used in a long time and fabrics that were delicate and prone to unraveling. Despite devoting nearly every moment I could to sewing, the ideas of a turban, reticule, shoe roses and cape were eventually abandoned in favor of the simple hope that the nightmare gown would be finished in time to go to the ball at all. I realized late in the game (as of the day of the ball) that the corset I bought wouldn’t work with the gown and that the pattern was designed to flaunt a lady’s assets by exposing as much bosom skin as possible. Lacking sufficient underpinnings to wear it well, and with a troubling degree of cleavage spilling out of the gown, there was nothing to be done but to own it. When we entered the ballroom, my dress no longer mattered as I took in the appearance of the other ladies, their gowns floating about them as they turned and walked and skipped around the dashing men in their finery. There were more than a few redcoats, a few kilts and a vast number of poorly executed cravats among the handful of stellar ones. Although boots were not acceptable dance-wear during the Regency, a good third of the men were wearing them anyway. You won’t hear any complaints from me on that score, although I wondered how many were newly purchased for the occasion. The music transported us in time and place, in spite of the caller who was guiding the dancers with instructions that sounded as foreign as French to my ears. I knew few among the crowd, except for one couple who met us there, but anonymity turns out to be a blessing when stepping on another’s toes. Most of the dances were simple enough as long as I paid attention and didn’t get turned around. They are also fantastically fun! There is something to be said for dancing multiple dances with the same man all evening, especially when doing the scandalous waltz. The supper was mediocre at best: spinach salad, a roll, sliced ham and rice. It was certainly not the spread of delicacies you would see at a private ball, but the dessert, pound cake with fruit and whipped cream was delicious. I was having a good enough time to overlook the unfortunate menu once the dancing resumed. I would love to say that I’ll follow Elizabeth Bennet’s advice and look only on the past as it gives you pleasure, but in reality, it’s the sewing debacle running up to the ball that will serve me best as an author. Ditto for getting turned around during one of the dances and going the wrong way. One really can’t imagine these things as well unless one lives them. Coming soon to a chapter near you! To celebrate this initial post, I’m offering a signed print copy of my book, One Thread Pulled: The Dance with Mr. Darcy. I will mail it anywhere in the world. Make a comment on this post to be entered. The deadline is Friday, February 20, at midnight. What a fun event! Some lovely dresses! I wonder if you are ever going to finish your second book. You are the reason I do not purchase multi part books until the entire series is complete. I can only tell you that I have wondered the same myself these past few years when “life” has thrown a few curve balls that I didn’t see coming–although they were lined up like airplanes queuing to land. I’ve been obliged to focus on issues and persons in the physical realm who depend on me, and sometimes, these things not only rob me of time and sleep, but my ability to write. I’m truly sorry if my personal situation has caused you such pain that you now distrust multi-part series in general, but I sincerely hope that you’ll decide it was worth the wait when the book is released. As soon as I have a release date, I’ll be announcing it here and everywhere else I can think of. If there is one thing these two years have taught me, is that writing truly does bring me joy. I am posting the WIP on several sites as I go if you’re interested in seeing exactly how the initial draft is going. BeyondAusten.com, DarcyandLizzy.com and FanFiction.net all hold the current iteration of the next book. I apologize for being late to the game, Diana. I have been deep in edits this week for a new book. 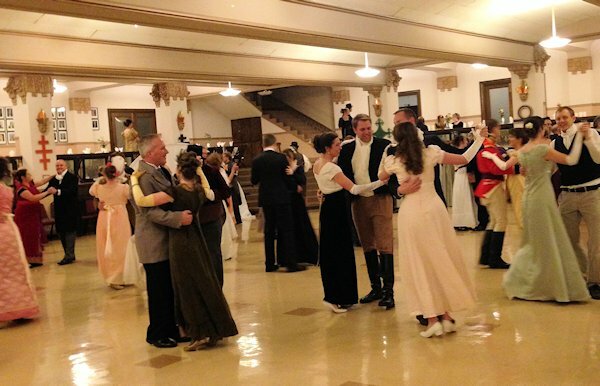 Yours was a delightful look at Regency dances. I made a dress for the Louisville JASNA event 2 years ago. The looks on people’s faces as we walked through downtown Louisville were priceless. Is there a picture of you in your dress somewhere on the web you could point us to? I’d love to see it!